At the end of last year, Shawn Micallef posted about English author Will Self’s walk from JFK airport in New York into Manhattan. 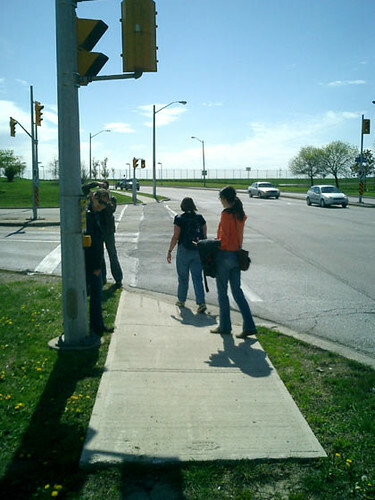 A surprising number of people commented on this post about their own experience of walking (or cycling) to or from Pearson Airport. And just today I heard someone say that the reason there is a Somali community on Dixon Road is that it is within walking distance of the airport, so that new arrivals without money could walk to the community (I’m not sure how reliable this information is, but it’s a good story). 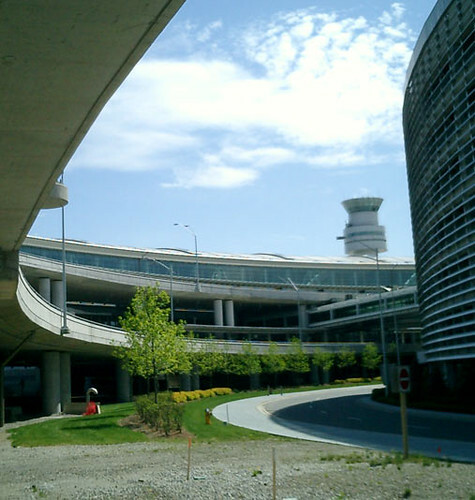 Walking from an airport is possibly the ultimate urban walking challenge, because airports are not designed to be walked from — you normally need a motor of one kind or another (car, bus, train) to get in or out. Inspired by Self’s feat and by this challenge, a group of Torontonians including myself decided to walk from Pearson Airport’s new Terminal 1 into Toronto, on a nice Saturday afternoon in May. (The fact that the airport’s Terminal 1 has been completely rebuilt meant we were exploring a somewhat new landscape from those who had performed the feat in years past). It was a fascinating and fairly epic walk, although unlike Self we didn’t get all the way downtown — just to Martin Grove and Burnhamthorpe, in the heart of Etobicoke, before resorting to the TTC. Nadia Halim describes the walk on her Squiddity blog, and I have written about the airport section of the walk in NOW (it reads slightly oddly because the dashes got lost on the web version). 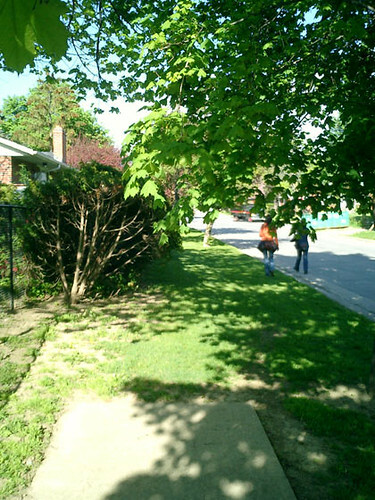 I’d like to add a few photos, and observations about the Etobicoke leg of the walk. The top image is was what we found when we came out of the back of the Terminal 1 parking lot. I was amused at the way the landscaping stops abruptly, I guess once it’s out of the main line of sight from the terminal. There is a sidewalk of sorts, but it curves straight back to the terminal. Past that, a walker is on their own. 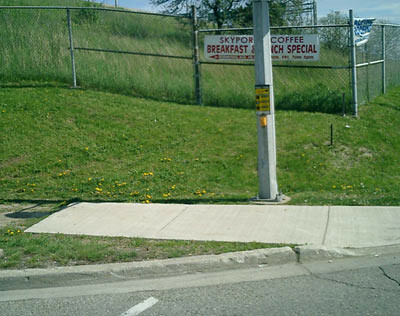 At the edge of the airport, the corner of Silver Dart Drive and International Boulevard, we found this — a pedestrian button, which must be the least-used in the city, and a candidate for the title of “shortest piece of sidewalk in Toronto.” The sidewalk really doesn’t lead anywhere — there is no sidewalk either to the south or to the north of it. The first neighbourhood we ended up in, Eringate on my map, was truly bucolic after the harshness of the airport. It was a real joy to walk in — there were sidewalks on every road, the trees were plentiful and full-grown, the houses were small and charming, often with balconies, and the (single, narrow) garages were set back from the street. And there was almost no traffic. When we saw children going by on bikes, and then later hit the oppressive concrete and tarmac of a busy major artery, Rathburn Road, it really brought to mind the paradox of the suburbs. The suburbs know as well as any downtown car-free activist that heavy car traffic is unpleasant — suburbs are specifically built to minimize local car traffic so as to create a pleasant and safe living environment. Yet the result is to force reliance on cars to move any kind of distance, creating busy, congested, unfriendly arterial roads that slice the city into isolated neighbourhoods. When we crossed the 427 and went south, there was a visible contrast with the previous neighbourhood. Many of the smaller houses were being torn down, and replaced by much larger homes — usually with two larger garages which were placed forward on the property, while the main door — the walking entrance — was recessed. 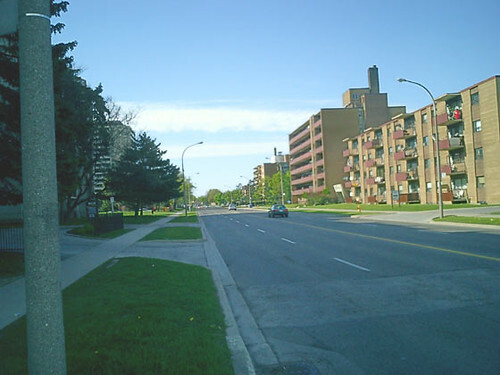 The contrast suggested that in recent years car culture in Canada has actually become stronger compared to the situation half a century ago when these neighbourhoods were first built — people have more and larger cars, and they use them so much that they will enter their house from the garage more often than from the front door. The sidewalks also became erratic. 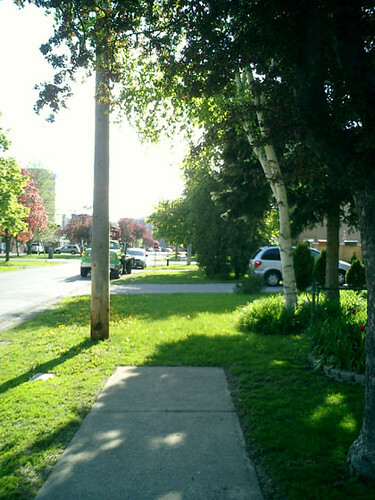 At one point the sidewalk ended, started up again, and then ended once more a few properties later (beginning first, end after, below). My final observation is about the grandly-named but rather desolate-looking The East Mall. It made me realize how much scope there is in Toronto for additional tree planting. You could easily line this street with healthy trees — there is a good stretch of earth on either side of the road. Not only would it make the street more attractive (so that it lives up to its name) and buffer pedestrians from traffic, but it would probably also serve as a traffic calming measure — it’s been shown that a sense of enclosure will prompt cars to drive more slowly. Nice. Maybe one day i will make the trek to Dorval, er, i mean Pierre-Elliott-Trudeau airport. Great story, a lot of subtext about our city. You don’t want to try this at Heathrow. I was there in the spring to speak at a convention, and planned to walk from my terminal to the hotel where I was staying. It was only a few blocks from the terminal, and should have been an easy walk. Having the motorised security cameras follow me every step of the way was somewhat disconcerting too.